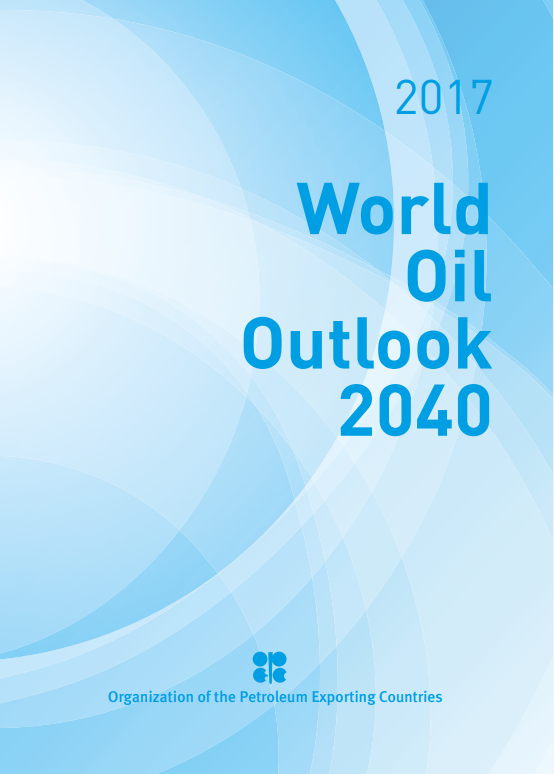 The Organization of the Petroleum Exporting Countries, known widely as OPEC, released their World Oil Outlook 2040 publication this week. The 364-page document lays out expectations for the coming years, including short-term, medium-term, and long-term forecasts. The forecast shows strong oil demand growth over the next five years, supplied by growing U.S. and other non-OPEC supply. Over the next five years, oil demand is expected to grow by 1.2 million barrels per day (MMbpd) annually, going from 95.4 MMbpd to 102.3 MMbpd. Developing countries will generate most of this growth, with 6.4 MMbpd of the 6.9 MMbpd of growth attributed to those growing economies. One major trend impacting oil demand will be new regulations requiring further desulfurization of fuel in some areas, requiring more complex refineries that consume more crude oil to produce the same amount of fuel. The U.S. is a leader in this regard, and U.S. refineries will see strong demand for low-sulfur fuel as other countries improve their refining abilities. In the long-term, oil demand will continue to grow, though at a reduced rate. Oil demand through 2040 is expected to grow by 15.8 MMbpd. In OPEC’s forecasts, developing economies will add almost 24 MMbpd by 2040, while OECD nations reduce their demand rates by roughly 9 MMbpd thanks to improving efficiency trends and adaptation of electric vehicles. Demand is forecast to remain strong from the transportation sector, though at a decelerating rate. Vehicle efficiency improvements will reduce the amount of oil needed for on-road transportation, freeing up more oil to be used for industrial (petrochemical and other) purposes. Use of oil for electricity generation is expected to decline in the coming years as natural gas grows its market share. The U.S. is the clear winner over the next year in the supply game, with U.S. production expected to grow by 3.8 MMbpd and accounting for 75% of all non-OPEC supply growth through 2022. American production, though, is forecast to peak during the 2020s, leveling off and capping non-OPEC production in the long-term. Brazil and China are also expected to contribute to non-OPEC supply growth. OPEC production will remain flat through 2025, after which demand for their products will grow rapidly. Once U.S. producers run out of sweet-spot Permian wells to drill, OPEC’s supply will begin to be more profitable, leading to a growth of 8.8 MMbpd between 2016 and 2040. Conversely, non-OPEC supply will fall by 0.3 MMbpd between 2022 and 2040. Economic uncertainty – the economy plays a major part in determining fuel prices. During the economic recession of 2008/09, oil prices fell significantly as supply remained constant and demand fell. Predicting economic growth over the next 20 years is a difficult endeavor, so OPEC performed a sensitivity analysis on how different economic scenarios impact oil demand. By 2040, the range between the low GDP growth scenario (3.3% growth annually) and the high GDP growth scenario (3.6% growth annually) was 6 MMbpd, meaning that demand could be +/- 3 MMbpd in 2040 depending on economic factors. Electric Vehicles – Electric vehicles are a hot topic that will significantly impact future oil demand. While OPEC did revise its estimate of EV growth higher than their 2016 paper, they thought it helpful to include a sensitivity case for aggressive EV adoption. Based on an aggressive EV market penetration of 80 million vehicle sales annually by 2040, oil demand could plateau in late 2030s around 108 MMbpd, 2.5 MMbpd below the reference case. Under the reference case, demand is expected to continue growing through 2040 as massive numbers of new drivers in developing countries offset demand loss from EVs. Energy efficiency – An even bigger threat to oil demand than EVs, energy efficiency could have a significant impact on oil demand through 2040. The OPEC paper looks at an “Accelerated Efficiency” (AE) case in which policymakers and technology companies work cooperatively to continue efficiency, rather than the hodge-podge of efficiency policies currently in place. Interestingly, the scenario does not consider even more aggressive efficiency coming from new technologies. Overall, the AE case reduces oil demand by 3.2 MMbpd in 2040 compared to the reference case, the majority of which will come in developing countries (where efficiency policies have not yet taken hold). It’s interesting that a concerted push towards energy efficiency could have as significant an impact as slow economic growth, and a stronger impact than electric vehicles.